Sure, Klout may be one tool for measuring influence, but no one “on the inside” of digital marketing actually puts much credibility into it. It was a great tool when it emerged three years ago, but there are more developed tools for measuring influence. It’s pretty much using your EPA-sticker from your used car to prove your fuel efficiency – inaccurate, unreliable and a known diversion from the actual facts. One quick way to lose credibility within the online marketing world is to lead with your Klout score – you should have case studies and campaigns you can point to where you raised awareness, created ROI. Here are three quick ways to use Klout to lose credibility for your online marketing agency. 1. Decide that a Klout score is important. This is exactly what Anchor Communications did, but wait… there’s more. 2. Issue a press relase about Klout scores. 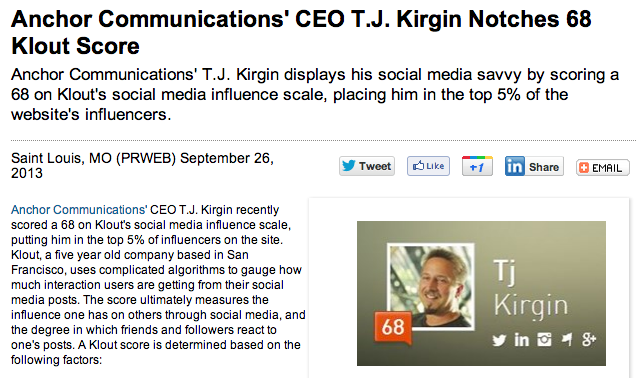 Anchor thought that Mr. Kirgin’s Klout score reaching a 68 was important enough to write and issue a press release… (I’m a 71/72, and haven’t even written a blog post about that). Not only does this type of press release tell the world that you think Klout is the amazing influence tool it’s not, but it says that you’ve got nothing else to talk about at your agency. Any cool campaigns or client work going on? Talk about that. 3. Linking to pro-firearms and swimwear-wearing models from an official company press release. 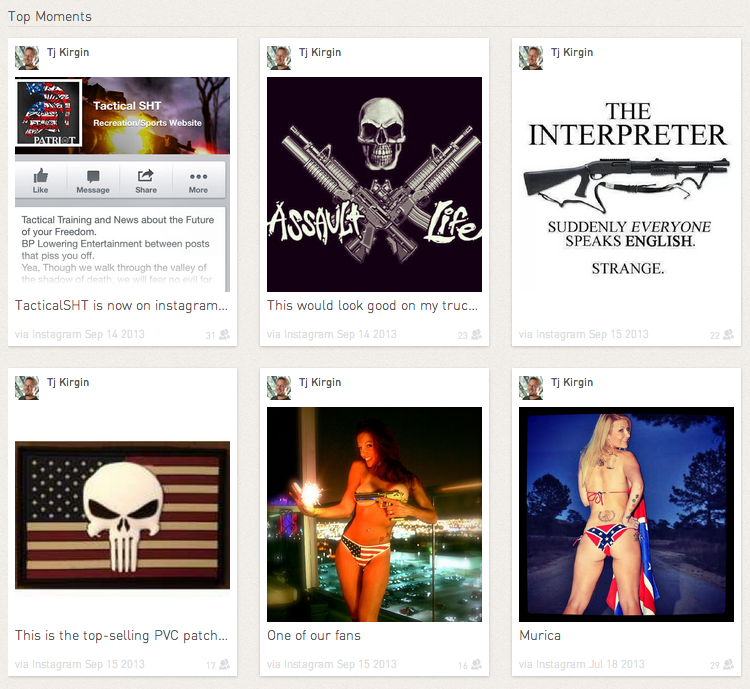 And clicking through to his Klout page, as linked from an official company press release and distributed by PRWeb, is his love of firearms and scantily-clad women. Probably not the types of messages you might want associated with your company if you’re considering hiring an online marketing agency. Yes, this a press release on someone achieving a certain Klout score. The guy has 128 followers: http://t.co/gqW5mXQ2i4 Wow. Not my an impression I’d like to leave for my company. What about you? Let me know about your thoughts below. Similar thoughts from Joey Devilla.